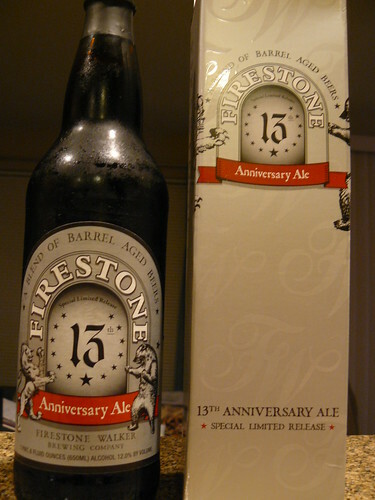 Intro: Going back to when Firestone Walker released their 10th anniversary beer in 2006, these very limited special releases have been heavily sought after. I believe (correct me if I’m wrong, please) that this will be their first anniversary release available outside of the brewery. Description: Pours black with a tint of dark brown around the edges. Medium head fades quickly to just a bit left on the glass. Big coconut and nutty bourbon aroma. Taste has coconut, chocolate, vanilla, and dominant bourbon, but it’s not over the top. The coconut really sticks out, which I love. Smooth as can be, and even at 12% ABV I could take down a bottle of this by myself (don’t worry, I shared with Jeanne). There is a taste of alcohol, but no burn and it doesn’t detract. Moderate thickness. This is just a really wonderful blend. Part of me would love a little more stout in this, but it’s hard to argue with what it is. Nicely done. Verdict: Find at All Costs! Availability: It will be on sale in Seattle soon in very limited amounts, but I’m not exactly sure when yet. I’ve heard that Bottleworks and Full Throttle will have it for sure, and I’d assume places like 99 Bottles, Malt & Vine and Pike St. will get it as well. It will set you back over $20 for a 22oz bottle, but throw in with a couple of friends if you have to. We are extremely honored to present to you our 13th Anniversary barrel aged blend! This is our fourth barrel aged release and each year is another adventure into the flavor unknown. Our oak aging cellar continues to grow and so do the blending possibilities. We peaked at just over 120 barrels in our program this year, yet only 53 barrels made this year’s final blend. We have stayed true to our original goal of making straight ahead strong ales and letting them rest in wood barrels to mature and develop flavors slowly and naturally. We again met with some of the area’s best wine makers and allowed them to guide us to the finished product. Most of the beers that are in this blend are old friends who we know well. Dark and ominous Parabola along with the rich and complex Bravo Brown were brewed again this year and together became the center piece of this blend. Other beers like the Rufus and Opal along with Sean Paxton’s Saucerful of Secrets are still tucked away in the cellar in their original first generation form, gaining character with extended aging. Velvet Merkin has established itself as a real barrel loving beer, although it is only 6%, it carries barrel qualities beautifully. A new beer, that was created this year by our Cellar Master Ali Razi, is Double Double Barrel Ale and it found its way into this blend as well. In the end, this year brought us seven wine makers and seven beers to counter balance our lucky thirteenth year of brewing beer on the Central Coast. The brewery is alive and well and oak is as much a part of our program today as it was back in 1996! As a finished beer, 13 is more sublime then last year’s blend. It is all about the subtleties and quiet tones. It has deep dark chocolate notes and is accented with dried fruit and licorice. There are hints of molasses and even a little cherry in the middle complimenting the vanilla and coconut notes brought in by the oak. These barrel qualities are very well integrated and meld well with the roast malt and caramel undertones. It is best enjoyed in a half filled brandy snifter or wine glass. Allow it to warm to 55F to fully enjoy the pleasing and complex aromas. If left in a cool dark place, I suspect that this beer will age well. It was a pleasure in the making and I truly hope you enjoy our fourth oak- aged blend! The XII was available outside the brewery as well. I know because I had a friend pick up a bottle from By the Bottle in Vancouver last year. I need to crack that open!